Note: This review originally ran after the film’s screening in March at the South by Southwest Film Festival in Austin. It has been edited and modified for its theatrical release. As normal as “smart” gadgets and cars are becoming, it’s still scary to think about all the possibilities of technology — especially the tech that works almost reflexively. Many films venture down these avenues. Whether it’s the world being overrun by artificial intelligence or the act of uploading your consciousness to the web (to live forever) the line between science fiction and reality is blurring, and fast. Leigh Whannell, writer-director of INSIDIOUS: CHAPTER 3, doesn’t think these near-future gadgets are going to fade from the big-budget rotation any time soon. From the first few minutes of his deliciously spare sci-fi film, UPGRADE, it’s apparent he has assembled a thoughtful human drama that uses its big concepts not solely as a vehicle for action or mind-bending plot mechanics, but to also ask some vast ethical questions about power and our existence. Set in a not-so-distant future, UPGRADE showcases the world driven by technology. It’s everywhere and steers our way of life to the point you’d almost expect Pixar’s WALL-E to roll up. But it’s more than people just having the best tech on the market. It also can be found within us. Instead of humankind creating robots to do their activities, they can put microchips in their bodies and equip themselves with firearms that literally turn your arms into guns. 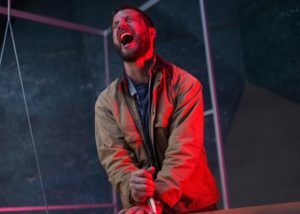 Logan Marshall-Green stars as Grey Trace, a quadriplegic who becomes a killing machine when he agrees to have an experimental computer chip implant put in him. Courtesy of Blumhouse Tilt. In the film, a mechanic named Grey Trace (Logan Marshall-Green) enjoys the peace of not depending on technology and not burying his face in the latest devices. He enjoys working on his Trans-Am and being able to have a relationship with tangible things. His loving wife, on the other hand, played by Melanie Vallejo (WINNERS & LOSERS), leans on tech. Her self-driving car gets her to and from places. She checks her email on her computer-screen tabletop and relies on an Alexa-like home operating system. One day, Grey needs to drop off a car he’s serviced to some tech wiz (Harrison Gilbertson, who looks like he’s the reincarnated James Dean). He asks his wife to join him so he can impress her with this mysterious guy’s achievements and underground lair. She immediately recognizes him as Eron, the brainchild of a company that makes advanced systems and software a la Steve Jobs and Dr. Eldon Tyrell from BLADE RUNNER. His mannerisms and presence hint at something sinister, and from this moment, Grey and his wife’s lives change drastically. 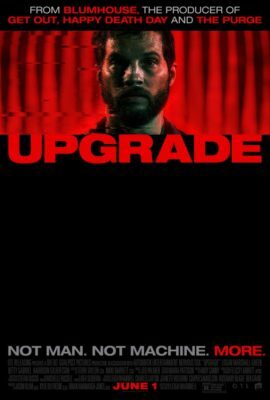 UPGRADE is a fun movie and it’s easy to get lost down its rabbit hole of wonder, but I’d rather not spoil the excitement of what happens in the next chapter of Grey’s life. To keep it super brief, it involves an implant that gives him unique abilities — like John Wick-killing abilities. It’s insane! It’s these kinds of films that earn their place in the genre’s time capsule. They’re not exceptionally loud or explosive, and they don’t allow their sci-fi elements to overthrow the human story at their center. UPGRADE is low-key and big simultaneously. It’s a bloody good time if you are fan of clever sci-fi premises steeped in relatable drama and B-movie action. UPGRADE opens Friday, June 1.